"We On The Train!" by Margaret Maron, in Ellery Queen's Mystery Magazine, May 2015. If you have ever read a book to a small child you know that the highest possible accolade they can offer is an immediate "Read it again!" The first thing I did after finishing this story is start it over. Of course, it helps that the story is very short - flash fiction or close to it - but it is so clever that I had to take another look at. Greg McInnis is a DEA agent who prefers to do his business traveling by train. On a trip up the east coast he is amused by a young African-American woman who is gleefully phoning everyone she knows to tell them that she is going to visit New York with an older man she says is her Uncle Leon. 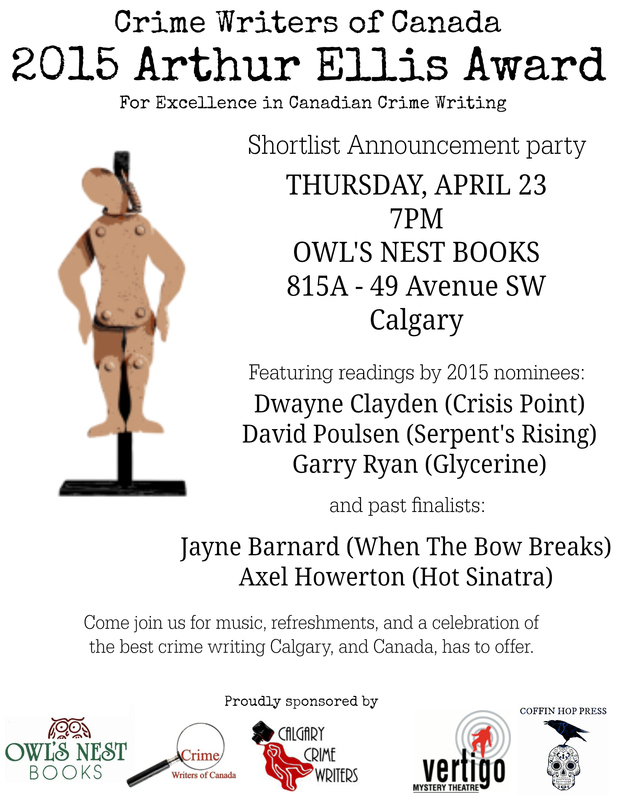 The Crime Writers of Canada have announced the nominations for the Arthur Ellis Awards. Congratulations to all the short story nominees, eh! "The Continental Opposite," by Evan Lewis, in Alfred Hitchcock's Mystery Magazine, May 2015. This dude Lewis is turning into a major threat. First there were his stories about Skyler Hobbs,who thinks he is the reincarnation of Sherlock Holmes. Then tales of Davy Crockett's ghost, who harasses his descendents into solving crimes. And now he has revived Dashiell Hammett's famous character the Continental Op. Brief pause for confusion from the readers. But Hammett's family owns the copyright! And Lopresti doesn't like fan fiction (Author B writing new stories with the characters of Author A)! True. But I am sometimes a sucker for reboots, in which Author B rethinks the original and comes up with a new twist. This story takes place in the fifties, decades after the Op's last appearance. The main character is a young detective named Peter Collins (he notes bitterly that his father deliberately gave him a name that is gangland slang for "nobody"). Peter works for the Portland, Oregon branch of a national detective agency and when he accuses his boss of corruption the company sends in a retired op who used to work for the San Francisco branch("sometime in the forties Continental had put him out to pasture, and he'd spent the years since killing a vegetable garden, sneering at golf course, and not catching fish.") . Peter finds him sinister and refers to him as the Old Man. Hmm. In Hammett's stories the Op's boss was the Old Man, but it is clearly not the same person. In fact, this new guy strongly resembles Hammett's hero, much older and, if possible, more cynical. Now let's address the copyright issue. Does Lewis use the name of the characters? No, because the Op never had one. (And Old Man is hardly a unique moniker either.) The Op worked for the Continental Detective Agency. Peter works for Continental Investigations, which recently changed its name from something or other. A brilliant story, and the first of a series. I can hardly wait. 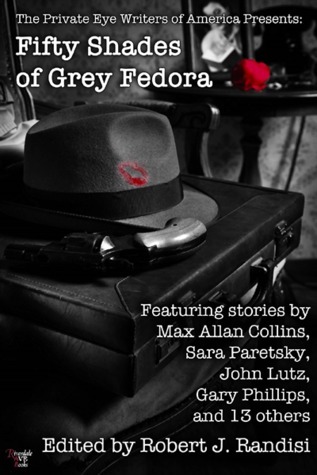 "The Fedora," by Terrell Lee Lankford, in The Private Eye Writers of America present Fifty Shades of Grey Fedora, edited by Robert J. Randisi, Riverdale Avenue Books, 2015. The first story I reviewed form this book was a private eye story. Now we're into noir. The nameless narrator makes a living doing low-level investigatory work for his uncle, a P.I. Then uncle's friend Milo explains that he is going overseas for six months and wants someone to keep an eye on his wife, make sure she isn't fooling around. And of course, she's gorgeous. If you have read any noir at all I don't have to tell you what happens next. And the ending will bring bad news for somebody. A well-written, moody little story. The International Thrillers Wirters has announced their nominees. Congrat to all!